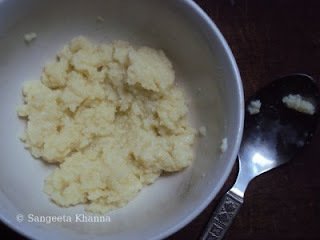 Khoya or khoa is thickened milk till it gets dry , almost like a ball of evaporated unsweetened milk . It is normally used to make sweets like peda and burfi and many more sweets or mithais as we call them . I miss getting fresh khoya off the counter for making my gujias most and always end up reducing the milk for hours on end in a thick base kadai . But that i do when i have to make gujias for holi n khoya is needed in large amounts . 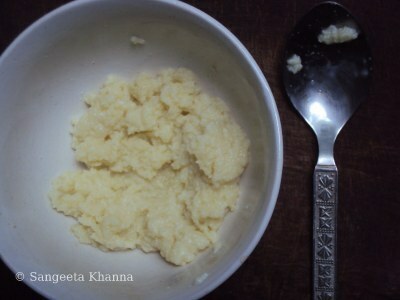 Sometimes just a 100 gm or 50 gm khoya is needed and reducing it the traditional way is not at all practical . Milk powder comes handy for this purpose and that is a must have item in my pantry , milk powder or dairy creamer whatever you call it , it can give you khoya instantly without messing up with you kitchen and utensils.........yes in a glass or ceramic bowl and a couple of minutes in front of the microwave.............that's all you need to do . 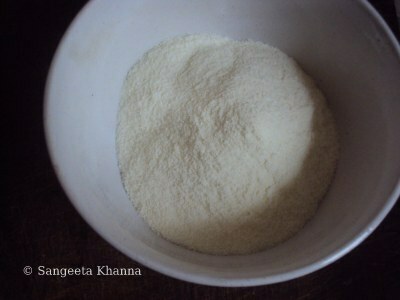 A teacup of milk powder goes into a 500 ml capacity bowl . ........daanedar khoya minton me taiyyar ..........it took less than two minute (1 minute 25 second to be precise ) for this quantity and you get a tea cup of loosely packed khoya . This khoya tastes similar to the one we get in khoya gali of Banaras n i suspect the traders make it with powder milk themselves. The khoya available in delhi is spurious and i never buy that after just one trial..
kewl :) 2 min mein khoya, kya baat hai.... Can I make it on gas stove....? for us here this method very useful..although we get khoya here very easily...thanks for sharing..
@ Puja ...yes it can be done on gas stove too . Mix required amount of water in the milk powder placing it in a kadai , add a tsp of ghee , bhuno ( dry roast ) on gas stove on very low flame for 3-4 minutes for this quantity . It may take even less time depending on heat level you use . Other wise , make a stiff dough with water and milk powder , tie the dough into a muslin cloth and place it into a small colander which can fit into your pressure cooker , you can use a small sized wire rack too . Now fill a little water in the cooker , the level of water should not touch the milk powder dough and steam it using the lid without the vent . After about 10 minutes of steaming , you get daanedar khoya .Both these process are a little messy so i prefer the microwave method. Let me know if you try any of these. arre, this is so cool! i like rich creamy gravies and am definitely going to try this and wait for the khoya matar recipe..
Sangeeta, this is so simple and time saving. Thanks for sharing. It is so simple and no-fuss idea that it makes me want to bang my head that why didn't someone thinkof thi earlier :) awesome!! Thats great..so I can now make Khoya Matar. I dont eat market Khoya ...this method will be of great help. That was one of the best tips I have read over the net. I don't usually like to cook in the microwave, except rice. But this khoya, I will definitely make. 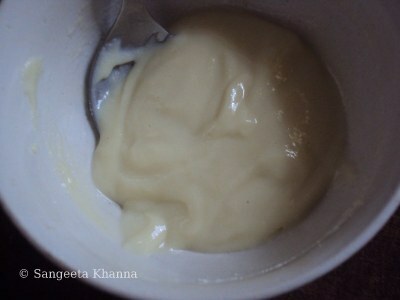 I don't get any kind of khoya out here, or maybe it is frozen but I am not sure how good it is. This is good. Thanks Sangeeta, I love your blog. You wouldn't be disappointed Nupur. I make my gujhia using this home made khoya with milk powder always and it pleases everyone each time. Please let me know your experience. This khoya keeps well for about a week at room temperature but preserving this khoya beats the purpose of being it an instant khoya. Why not to make it when required? 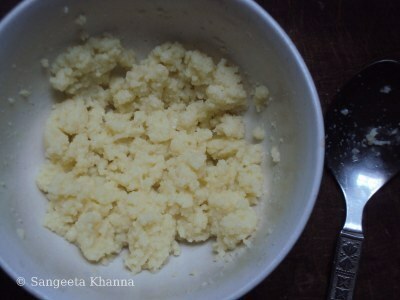 To make peda, just add sugar to taste to the prepared khoya, cook till smooth and the mixture forms a ball in the pan. Cool till it can be handled (not completely cold) and shape pedas, the pedas will be set after cooling. How many days it can be preserved & how to make pedas from this? The methods that you have described above for making is indeed very interesting apart from being easy. Ingenious. 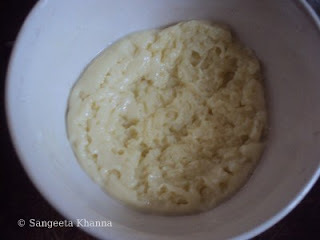 I am going to try a variation of the steaming method - making khoya in a south indian puttu maker. I will post the results as soon as i do it - i have to purchase milk powder first. will do in a day or so. Oh that looks like a good idea but I have never used a puttu maker so wont know how easily it will clean etc. Please let me know how it worked. Thank you Geetha.